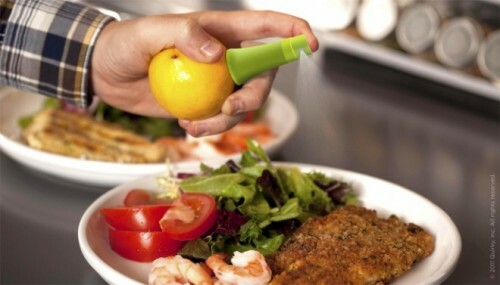 Stem Accessory Lets You Squirt Fresh Citrus Juice | OhGizmo! We can’t really think of any occasion where we’d want to delicately spray citrus juice onto our food, but we’re not in any position to know as we consider deep fried pizza delectable. Should your gastronomical self be better suited to require such a thing, you should know that the Stem accessory in this article lets you take an actual citrus fruit and squirt the juice directly from it. Simply insert, squeeze and squirt. Clearly you won’t be able to get all the juice out of the fruit but if it’s fresh you’re after, then this is probably better than that bottled concentrated stuff we usually like to drown our fish and chips in. The Stem is currently in the Quirky production process, which means it doesn’t yet have a date of availability, though their projected price for the item is $5. They’re honing the design and we do expect to see an actual product on shelves at some point. Lime juice to go with your beer!! !